A fixed mount VHF airband first! The IC-A210 has an organic light emitting diode (OLED) display. The OLED display emits light by itself and the display offers many advantages in brightness, vividness, high contrast, wide viewing angle and response time compared to a conventional display. In addition, the auto dimmer function adjusts the display for optimum brightness — day or night. It’s fast and easy to select any of the IC-A210's memory channels. The “flip-flop” arrow button switches between main and stand-by channels. The dualwatch function allows you to monitor two channels simultaneously. In addition, the auto stack memory stores the last 10 channels used and allows you to recall those channels easily. When connected to an external GPS receiver* equipped with an airport frequency database, frequency data for nearby airports can be used in the IC-A210. * Ask your dealer for available GPS receiver details. The built-in DC-DC converter accepts a 12/24V (11.5–27.5V) DC power source. 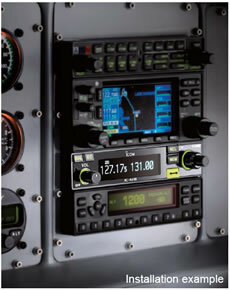 The IC-A210 is easily installed in most airplanes or vehicles. The IC-A210 has a built-in voice activated intercom function allowing the pilot to talk with the copilot via the headset. The IC-A210 has adjustable audio level and squelch control functions. The IC-A210 neatly fits inside the common mounting brackets used on most airplanes including Icom’s IC-A200. Two types of rear-panel adapters are included, allowing for streamlined plug-in connectivity. * Ask your dealer for compatible panel mount radio details.